Featured in July 2003 Railway Modeller. Offered for sale at this exhibition. 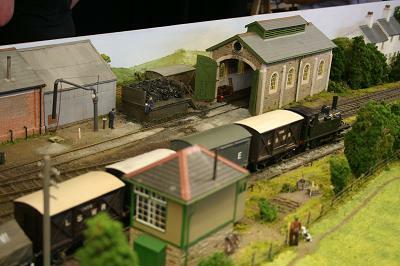 The layout was built as an entry into the 2003 small layout competition staged by the D&E societies at their annual meeting in Burton-on-Trent and Carlton Metals was selected as the winner. 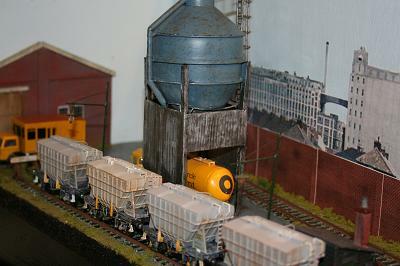 The layout is based in the Nottingham area and features a metal scrap works dealing with the disposal of worn-out railway stock, with the occasional locomotive being deposited before being scrapped. Trackwork was built using SMP fine scale with the exception of the central diamond crossing which is Peco. 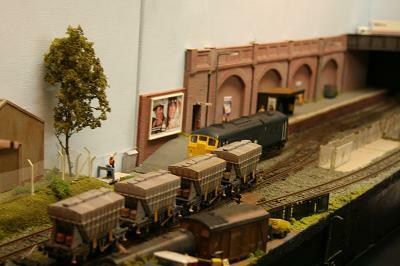 A comprehensive 5-page article about the layout was featured in the July 2003 Railway Modeller. Plans for a standard gauge light railway running south-east from Canal Head in Kendal, Westmoreland to Arkholme, serving various quarries and gunpowder works, as well as local farming interests, failed for lack of money. 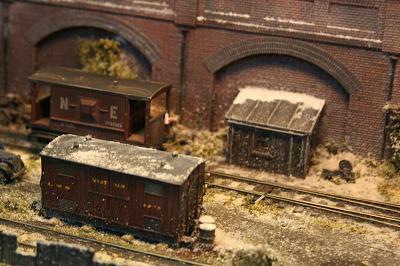 I have suppposed for this layout that a narrow gauge line - a much cheaper option - was built. The layout represents the northern terminus in the 1930s. 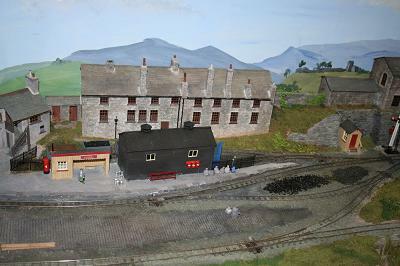 The canal is little used, most traffic being transferred to the LMS at exchange sidings just south of the area modelled. Trains to and from the exchange sidings are shunted at the wharf. 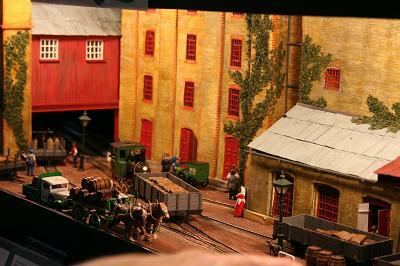 The buildings are all hand-made, mainly from car, and are based on actual buildings from Kendal. 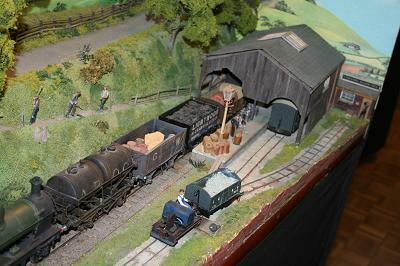 The carriages and wagons are from kits and the locos are from the excellent Backwoods range of kits. Clayton West closed to traffic in 1983 with the closure of the associated colliery. This layout is based on the premise that government funding was made available to regenerate this area, resulting in a shopping village, new homes and businesses on the colliery site. Electrification of the branch from the main line would have been instituted in the early 1990s, allowing services to run through from both Manchester and Leeds, though cost restrictions have meant that only the bay platform is energised. The station occupies the site of the colliery sidings, rather than being a rebuild of the existing station, as the land there would have been sold for redevelopment. In addition to the shopping complex, behind the station, there is a distribution centre, which variously handles parcels or vans, depending on the operator's whim! There is sufficient siding space to accommodate engineer's vehicles, locomotives resting between duties, spot traffic flows and weekend stabling. 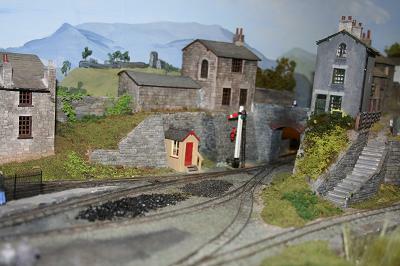 The layout uses DCC (a Lenz Compact system), with traditional 12V control retained for the points, signals and lighting. The overhead catenary is made from modified Sommerfeldt parts and steel wire. 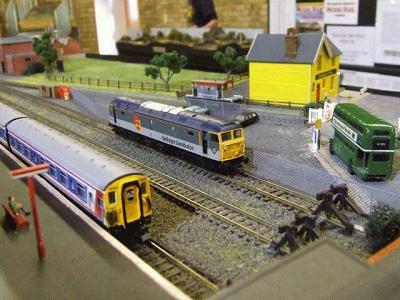 The layout uses a great many ready-to-use building components and attempts to portray the last year of the nationalised network, with a wide variety of locomotive types and liveries. The points are Peco code 75, but the plain track is C&L, giving a much better representation of scale sleeper spacing, even within the compromises inherent in OO. Gamle Carlsberg was a brewery established in 1847 at Valby, near Kobenhavn by J C Jacobsen and named after his son Carl. 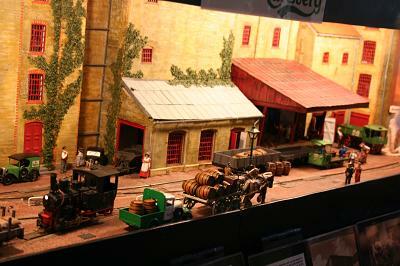 A narrow gauge railway was established in 1908 within the brewery and to link it to the later New Carlsberg brewery. Most rolling stock came from Germany, but an 0-4-0T came from Britain. A steam railcar was purchased from France in 1912 for the use of the directors. 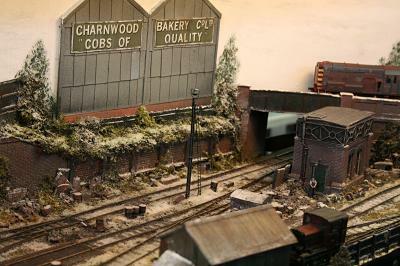 The model shows the old brewery in the early 1930s when the system was at its zenith. The railway served Carlsberg well, but by 1957 lorries had taken over and it closed. The brewery is now a visitor centre. The layout is presented theatrically in a box so that the viewing angles and lighting can be controlled. It has a simple track plan and no run round. It is operated as a shunting puzzle, to solve which the operators must use (at least) two locomotives. This is assisted by the use of DCC. Points are changed with Fulgurex motors and couplings are Kadee. The principal rolling stock is Fleischmann. 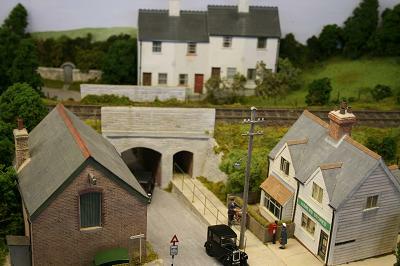 The layout depicts an (ex) LSWR branch line terminus in the North Cornwall coastal area, west of Padstow. The track plan is typical of the South Western. 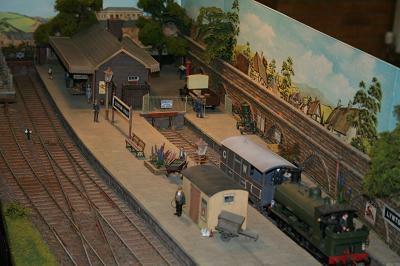 All railway buildings are models of actual structures on the old South Western system and are scratch-built, apart from the signal box, which has been built from a kit of the box at Swanage. Rolling stock is again kit or scratch-built and is representative of two different periods: LSWR in 1924, soon after grouping, and BR (Southern Region) in about 1960. Usually the different periods will each be shown for one day each at two-day exhibitions. We follow a sequence of operations that represents a typical series of movements and ensures that not all the stock ends up at one end! To ensure there is always something moving, this sequence is far more intensive than the prototype. A fictional line, the Swimbridge & Lynton Railway was, like many lines, a triumph of optimism over reality. Funding ran out before Lynton was reached leaving a short route from Swimbridge to Arlington (Named Lynton Road). which was soon sold to the GWR. Fortunately, passengers and freight could continue on the better known Lynton and Barnstaple narrow gauge line, providing a steady revenue. The railway connections caused the market at Arlington to grow rapidly. On market days, the passenger railmotor is supplemented by a rake of elderly coaches and additional freight services. Holiday makers also swell passenger numbers and warrant extra services. Today is a market day during the season of 1927 and Lynton Road will be bustling. Locomotives not normally seen on the branch will appear. Hence the train spotters' enthusiasm. The line was originally planned to be built as a narrow gauge line by the Vale of Rheidol Railway, but this never happened and although plans were later submitted by the LA&NQLR to build a standard gauge railway following the planned VoR route, it would be the Cambrian Railway which eventually would build the line, albeit with a few deviations which included running the line into Newquay, crossing the Lampeter to Aberaeron line at Crossways. Work finally started in 1911 and the line was completed just before the outbreak of the Great War in 1914 and would be operated by the GWR. The layout is based circa 1970, on the coast of Cardigan Bay near Llannon, between Aberystwyth and Aberaeron, and consists of a small single platform station with run-around sidings for goods and coal. The later additional siding accommodates the Provender shed which houses foodstuffs amongst other merchandise. The total size of the layout is 12 feet long by 18 inches wide, which consists of an 8-foot scenic section and a 4-foot sector plate fiddle yard at the southern end of the layout. The layout could accommodate another fiddle yard at the northern end but no plans for this have been decided at this time. The layout is built to EM gauge while all wiring of the electrics have been done in such a way, via a return lead, that it will allow contorl to be either DC or DCC. The layout is so named as the baseboards started life as 2 forklift pallets and is an imaginary urban branch line Station set around 1977. 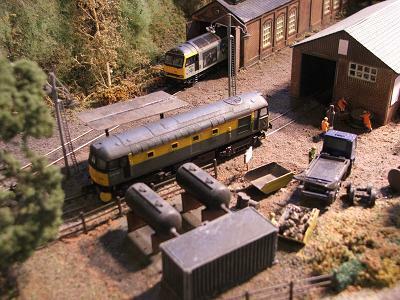 The layout is not set in any particular city and changes based around the stock and vehicles on display but the inspiration from the layout came from childhood memories of travelling on the Severn Beach line in Bristol. The station area is loosely based around Clifton Down; cement terminal is similar to that at Lawrence Hill, and the fuel oil siding around Shirehampton. The small station still sees a regular passenger service usually a 1 or 2-car suburban DMU, as there are a number of large factories in the Pallet Lane area. The passenger facilities are rudimentary, just a small wooden shelter on the platform. 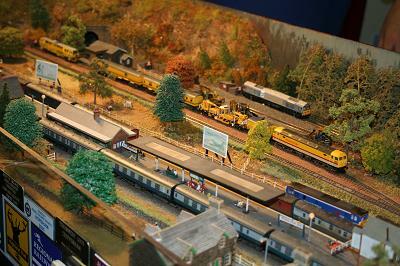 The layout in the format exhibited today is 12'2" long by 17" and is DC controlled, trackwork being Peco Sreamline code 100. All stock is modified Ready To Run and kit-built weathered and detailed. Woolton is a freelance layout, based upon a country station on a branch line off the Didcot to Southampton line in North Hampshire. The station and goods yard served the local market towns, with a former branch line serving other market towns to the north through the rear tunnel (now a road). During the 1970s, road transport became more favourable to the market town's local businesses, causing the north branch to be closed and the goods yard redundant. A small neighbouring oil refinery came to the rescue of the yard. Due to the nature of the access into the depot, the block trains would enter into the yard where the locomotive would run round or a second locomotive would take the train back up the branch line into the refinery. 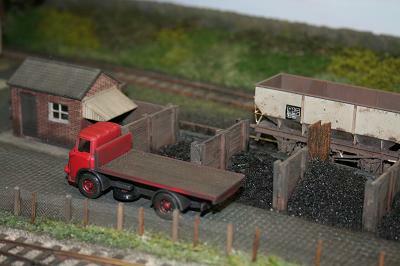 Similarly, empty stone trains would enter the small loading facility at the local quarry up the branch line. Coal trains are required to serve the boilers at the nearby MOD base, together with Speedlink services. The yard is approximately halfway between Didcot and Southampton, making it suitable for the exchange of locomotives conveying civil engineering trains. Passenger services range from Basingstoke/Newbury/Paddington, through Network Southeast and Southampton/Didcot via Inter-City cross-country services. 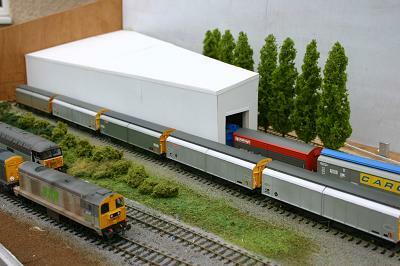 Worcester Road Diesel Depot is Gauge 1 1/32nd scale. It is a straightforward shed, 10 feet by 2 feet, operated from the front. 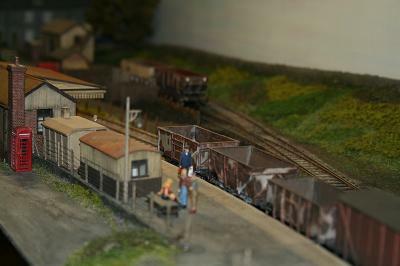 The scenic/diorama engine shed board is 6 feet long and the fiddle yard board is 4 feet long. With the side wall removed, giving a wide screen pillar box aperture for viewing into the shed, the viewer is forced to get down low and appreciate the vista in a more realistic view from ground floor. If you get close enough to the model, the viewer becomes part of it and it is possible to belileve you are in the shed with the locomotives, especially if the outer edges of the strucure are beyond the viewer's peripheral vision. Everything within the locomotive servicing shed has been scratch-built, apart from the barrels,lathes and other tools which have come from 1/35th military modelling kits. 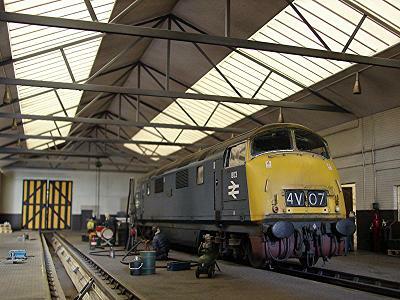 Worcester Road is located in Hereford and acts as a small service point able to supply fuel/water/oil and other daily servicing requirements for the diesels that arrive on the London trains, predominantly Warship class locomotives. It is also used occasionally to service rolling stock when the carriage and wagon repair shops are full. It must be emphasised that the only authority to enter a diesel depot issued is in the form of a permit from the responsible office. So it is with thanks to Mike Walker (show organiser) who has allowed you a permit to access Worcester Road. Please take time to enjoy Worcester Road Diesel Depot as it has taken 10 years to build. 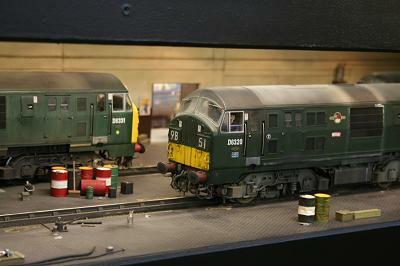 Steve Harrod is a member of Cheltenham Diesel Hydraulic Modellers Group. Yarnham is a small seaside town in West Sussex close to the banks of the River Arun. The station is situated at the end of a branch off the former LBSCR Coastway route. In former years, there was a line that continued beyond the town to the harbour. Today the truncated remains form a headshunt for the wagon repair depot. The station is served by various Mk I slam-door units working Coastway or Mid Sussex line services. Freight consists mainly of civil engineers' wagons bound for the wagon repair depot. There is also Speedlink traffic including steel, which uses the yard to run round. 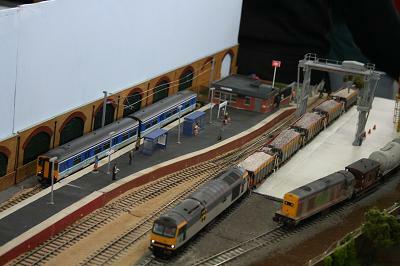 Trains are controlled by DCC, which is slightly more challenging in N gauge than in the larger gauges.